Religion is full of paradox, and Eastern religions are no exception. One of the most compelling paradoxes is that Eastern religions (Buddhism and Daoism) are closely linked with the martial arts. Religion is full of paradox, and Eastern religions are no exception. One of the most compelling paradoxes is that Eastern religions (Buddhism and Daoism) are closely linked with the martial arts. The most widely known temple arts are those practiced by the Buddhists at Shaolin Temple and the Daoists at Wudang Mountain. But why are martial arts practiced as a part of religious beliefs that teach compassion and humility? The idea of a warrior monk seems contradictory because the martial arts are linked in people’s minds with violence. However, in the traditional temple martial arts, what we are practicing is not violence, but the path of ending violence. Daoism is a religious and philosophical tradition which grew out of ancient Chinese Shamanistic nature worship, divination, and ritual. The “Dao” (道 – dao) refers to the organic order of the universe which creates all living things. The most widely known Daoist concept is the theory of Yin and Yang, which depicts the way in which the universe patterns itself through the interaction of interchanging opposites. An individual can be one with the Dao by living in accordance with nature and all its transformations and changes. For Daoist monks, our “way” of life includes rituals, diet, meditation, visualization, sexual practices, qigong, and martial arts, which are all used to create a peaceful mind and healthy body. By following the Daoist path, we seek to return to a level of well-being that we see as man’s natural state. Wudang Mountain in central China is a physical and spiritual sanctuary. Covering over 300 square kilometers, it has 72 peaks, breathtaking lakes and rivers, and a forest with over 600 known medicinal herbs. Home to dozens of temples, it is the world's largest Daoist center. Wudang Mountain is revered in the martial arts community and is seen by many as the spiritual home of the internal martial arts. Chinese martial arts did not begin in temples, but rather grew out of a long and chaotic history. People’s need to protect themselves, and desire to conquer what was not theirs led to the development of dozens of family and folk lineages. Ancient Daoists began to practice the martial arts in order to defend their temples, protect themselves as they traveled, and strengthen the body for long periods of meditation. Over centuries, Daoist theory blended into the martial arts, leaving both changed forever. When I was 13 years old, I traveled to Wudang Mountain, where I lived and studied at the Wudang Daoist Association’s Martial Arts Academy. Our training began with fundamental practices, a series of basic conditioning exercises used to develop the level of flexibility, strength, and balance needed to practice martial arts. Our fundamental practices included warm-ups (including squats and push-ups), stance training, and striking and kicking drills. Many of these fundamental practices were incorporated into the Wudang curriculum in the 1980’s. During the Cultural Revolution, many Daoists chose to leave Wudang Mountain to practice in secret. When China's social policies begun to relax in the 1980’s, many martial Daoists returned to Wudang Mountain. They compared their original techniques, and shared those that they had encountered in their travels, bringing about a martial arts renaissance. Those techniques that were judged to strengthen the body, and benefit speed and coordination, are now taught as part of the standard Wudang curriculum. After a year spent on the fundamental practices, we began to learn the Basic Form (基本拳 – ji ben quan) which further developed the skills taught in the fundamental practices. Once our development was satisfactory, we moved on to the intermediate and advanced forms of Wudang Kung Fu. These forms include 伏虎拳 (the Tiger Taming Form – fu hu quan), 玄武拳 (The Mysterious Warrior form – xuan wu quan) as well as 太极拳 (The Great Ultimate Fist – tai ji quan), and several weapon styles. 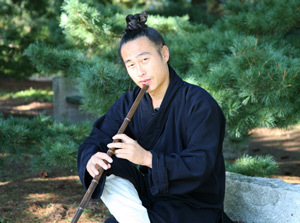 In these traditional Daoist forms, the vital energy of the body (气 – qi) is used to emit force, motion comes from stillness, movements are nimble and rounded, and force is tempered with mercy. Many Chinese characters are pictographs, pictures that represent an idea. The Chinese character 武 (wŭ) which means “martial” combines a picture of a weapon and the character to stop. This shows us that the martial arts discourage overt aggressiveness. 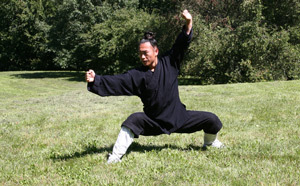 This is evident in the Wudang arts, where every movement is done in response to an attack. Instead of directly blocking incoming force, we learn to intercept and redirect an attack, “borrowing” it. The punches and kicks of the Wudang system are never used as initial attacks, and are all designed to use the other person’s momentum and force in addition to our own. The practical result of this is that the Wudang techniques are very practical, and can be used when fighting someone stronger than you. From a Daoist point of view, it is considered detrimental to impose your will upon that of another through physical or emotional violence. This belief is crystallized in the concept of ‘wu wei’ (无为) or ‘non-action’. ‘Wu wei’ does not mean not acting at all, but rather is a type of non-interference. It can be seen as a form of creative passivity by which you act in the right way, at the right moment; according to your surroundings, circumstances and means. Exerting your will upon another person or upon the world means moving against the “Dao” which is as futile and exhausting as trying to swim upstream. How many fights or wars are started by one side forcing their will upon another? This can only lead to further violence and will eventually diminish your own energy. This is a very practical point-of-view, because through practicing to end conflict can bring great benefits. Wudang Daoists are taught to keep our bodies healthy, and our minds calm. We see violence also as an inner emotional state. As we all know, it is possible to be completely still, but still have a heart full of violence. Intense physical training brings about an inner struggle. Martial arts practice shows us our weak spots and pushes our physical and emotional limits. However, you will find that you are learning a lot more than how to protect your physical body. You are learning to set aside anger, impatience, selfish desire, and hatred. In Daoism, we say you are cultivating virtue (德 - dé). Cultivating virtue can result in a determined will, a focused energy and clarity of mind. As your martial practice develops, you will slowly remove anger, fear, vengeance and selfish desire from your life. Jump to: Wudang Taijiquan DVD. Jump to: Wudang Kung Fu Fundamental Training DVD.